My Name is Christina and I’m A Hoarder. Hoarding is all over reality TV. People with mental issues, painful pasts and some possibly just plain lazy and don’t care. I guess for some people this is their way of getting help for the hoarding. More so if they don’t have the time, money or tools to help the person or themselves. Oddly enough, I am a hoarder. I say it in the same context as an alcoholic. You never stop being a hoarder I feel. You will always try to hoard something. You will always have the items you can never, ever get rid of and dare not let people know you have. Nevertheless, I love watching these shows. I feel I understand them, sometimes I’m just in awe of it all. Often I find myself thinking, “Thank God! I was never that bad!” Even though there are many times they are just as bad. My memory is just so faded out on the issue. I remember my hoarding has been a life long issue with me since I was a tween. A long, abusive relationship in my late teens, early twenties was the straw that broke the camels back however. Combine that with drug abuse and no friends of my own. The memories of those years are hazy at best. However I do know how I felt. Alone, scared, embarrassed, unloved. I felt like the most useless human being. I didn’t ask for help, I didn’t deserve it. At the time I didn’t consider myself a hoarder. I felt everything I did was “normal”, for me anyway. I wasn’t happy but this must be normal. I would try to clear the area around me. Fix what was broken but something would easily set me back. In the end, when the relationship was finally over and the drugs were gone. My eyes were clear to see. Look what I did to myself! My eyes well up just thinking about it. Regardless of how long ago it has been. It was a long, significant time in my life. That was me. That was who I was. For a long time. I sometimes go through small fits of hoarding. Nothing close to as extreme as before. When I realize I have fallen off the horse I find it easier to fix it quickly. Tossing things isn’t as hard as before. I try not to get attached to item or even better, avoid bringing things into the house in the first place. In the end I really do enjoy watching Hoarders and other shows like it. Even though I don’t really fully seem to understand why. The only thing I don’t like is that they don’t seem to truly show or understand how much the hoarder themselves are hurting. Sure they glaze over it with a psychiatrist or therapist but they are trying to do a quick fix for tv. Even so family members usually seem angry and unwilling or unable to understand. I never had professional help myself. After the issues were clearing up. My parents and brother would come over and help me gut out my apartment. It was always very casual, in hindsight I should have been a lot more embarrassed. Even after everything that happened I lived in that apartment for years after the fact. In January I moved out with my current boyfriend to a new place. My mom was helping me pack and clean the apartment. The new place was much smaller so I had to toss a lot of things I didn’t need. My mom and I were talking about all the events in the old apartment. Suddenly at one point she goes, “You know, you were a hoarder right?” I answered with a simple nod and said, “Oh.. yeah!” However it was only in the last few years I accepted the fact. In the end I don’t think it will ever go away. I try not to let it control me or make it who I am. I just tell myself the worst is over. Do you enjoy this type of reality tv? Has you life been touched by a hoarder? 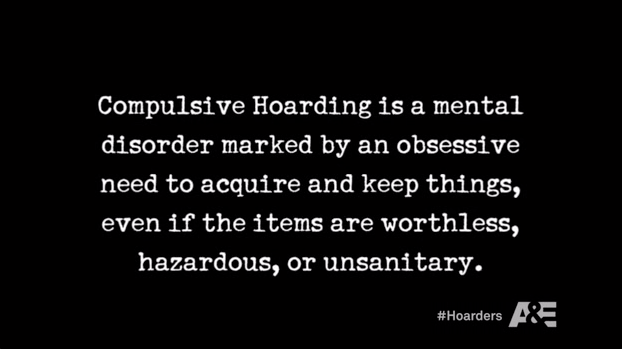 How do you feel about hoarding and OCD tendencies? Thanks for your post. It’s great to see that you have moved on towards a better ilfe and lifestyle. Good on you. I love watching Hoarders. I’m not as bad as the show (cliche, I know) but I find watching Hoaders motivates me to clean – I never want to end up like those on the show. I have trouble paring down my items, and when I moved just last week I had a major breakdown with my OCD. I too downsized – from my own apartment where everything fit where I needed it to, to my mums house where my stuff had to fit into a small bedroom. I’m still working through it all, but getting there slowly. I find I procrastinate. I’m always “too busy” to deal with it. Although never too busy to check my facebook 10 times a day and play games. I found your blog to be inspirational. I’m glad to see you acknowledge that it’s not something that just goes away. It’s an ongoing journey. Thank you.